How much should a healthy baby weigh? 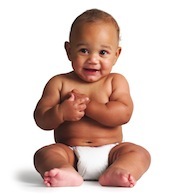 Weight varies from one infant to the next, but there are predictable patterns for infant growth. At birth, the average baby weighs about 7.5 pounds, according to the website whattoexpect.com. The “normal” range is between 5.5 and 10 pounds. All but 5 percent of newborns fall into that range. Expecting moms have some control over their baby’s weight when born. In the womb, he or she “eats” the same food as mom. If you’re over-indulging in potato chips, ice cream and cookies, your baby is, too. It’s therefore critical for you to have a balanced, nutrient-rich diet. The United States Department of Agriculture offers a personalized daily food plan for expectant and recent moms, customized based on your age, gender, height, weight, physical activity level, and stage of pregnancy or breast feeding status. As a rule of thumb, make sure at least half of your daily grains come from whole grains, advises the Mayo Clinic, such as eating a bowl of fortified cereal for breakfast or swapping out white bread for whole wheat bread at lunch. Additionally, fruits and veggies are critical to pregnancy nutrition because they provide essential vitamins and minerals to both you and your baby. For example, start adding blueberries to your morning yogurt and broccoli to your dinner casseroles. The small changes noted above can make a big impact on your baby’s weight and most importantly to his or her overall health.